Mr. Speaker, this past Saturday I had the honour of attending the grand opening of the brand new Marine Training Centre in Hay River. There’s been some secrecy surrounding the Centre, so I wasn’t quite sure what to expect, but I checked out the facility, and I spoke with the staff, and, Mr. Speaker, I’m happy to say it’s the real deal. Even though people have inhabited the area since time immemorial, the town of Hay River, as it is today, exists because of marine shipping and commercial fishing. With both industries experiencing a resurgence, the Training Centre couldn’t come at a better time. It’s operated by the Nunavut Fishers and Marine Training Consortium, a non-profit organization, which has its headquarters and a campus in Iqaluit, and has been doing this type of work for years. The Centre is located in the old NTCL headquarters on Vale Island. That building sat vacant for many years, but now the Centre is bringing new life to the area. The first floor has been completely renovated, and looks brand new. The classrooms are bright and roomy, with plenty of space to spread out nautical charts. 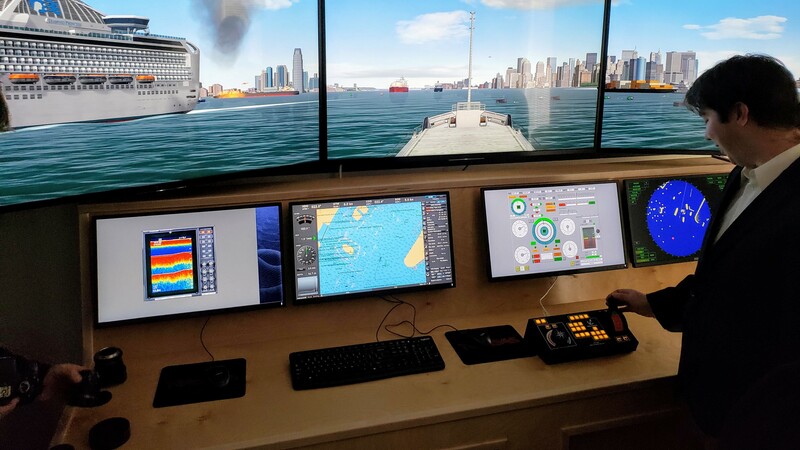 There are multiple bridge simulators, each housed in its own room, that can recreate a variety of environments – the two I saw demonstrated were New York Harbour, and the Ferry Crossing at Tsiigehtchic. They also have a full array of brand new gear, and one small craft – and a larger, multipurpose craft to assist with hands on training may be on the way in the near future. The staff I talked to were all very excited about the opening. They have many decades of on the water experience between them, and they bring that into the classroom. What impressed me the most is that they’re aware that not everyone learns the same way, and they’re able to adapt their teaching styles, even teaching basic life skills, if required. Even though they just had their grand opening, they’ve actually been offering courses for the past few months, and not just in Hay River, but they have put on, or have courses planned, for the Hay River Reserve, Fort Resolution, Inuvik, and Tuk. Current and upcoming courses include Fishing Master IV, Small Vessel Operator Proficiency, Marine Basic First Aid, Radio Operator Marine, the Bridge Watch Rating program, which allows those with is a little to no marine experience to become certified deckhands, and more. And, Mr. Speaker, the courses are free of charge. If this statement sounds like an advertisement, it’s because it is. I want to get the word out so that everyone across the NWT knows about, and can take advantage of, this great new training facility.